You can decide about returning the goods and inform us about it within 14 days after receiving. Brown Merino Wool / Camel hair fleece. Beige Merino Wool / Camel hair fleece. Ecru Merino Wool / Cashmere fleece. Grey Merino Wool / Cashmere fleece. One duvet 220 x 200 cm + two pillows 70 x 80 cm one duvet 180 x 200 cm + two pillows 70 x 80 cm one duvet 155 x 200 cm + one pillow 70 x 80 cm one duvet 140 x 200 cm + one pillow 70 x 80 cm Merino Wool / Camel or Cashmere Fleece on one side. 100% cotton on another side. EU-stock, high quality polish product, 750 g / m2. 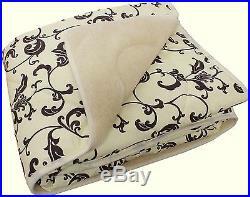 Beige Merino Wool / Camel hair Fleece Duvet. All the comfort and health benefits of merino wool with the added superb properties of soft camel hair. 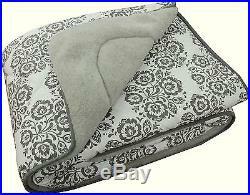 White Merino Wool / Cashmere Fleece Duvet. All the comfort and health benefits of merino wool with the added superb properties of soft cashmere. Merino wool bedding provides more restful sleep by maintaining even temperature and humidity. Offer protection against allergy-causing dust mites whilst the fleecy texture provides support and lasting comfort. Merino wool offer luxurious sleeping conditions Lovely and soft and comfortable Merino wool allows your body to breathe Merino wool keeps you warm in the winter and cool in the summer Merino wool keeps you dry and your body at the right temperature which offers relief from arthritis, rheumatism and other aches and pains Merino wool is resistant to dust mites making it a much healthier way to sleep Traditional bed covers filled with down insulate from external conditions and do not allow the air to go through. This disadvantage makes breathing through skin impossible. The organism gets overheated during sleep. For the whole night there continues a struggle for the right temperature covering and uncovering. Sleeping under a duvet or blanket made of wool is totally different. Wool enables breathing of the skin. Have the ability to shrink and expand when the temperature changes. It causes natural flow of the air and regulation of temperature. Thanks to this you may sleep under our wool duvet in winter and in summer. The most valuable is the wool from Australian Merino Sheep. Its outstanding properties are the result of the climate where sheep live. The temperatures vary from 40 C during the day to 0 C at night, therefore the wool has great ability to shrink and expand. Numerous advantages of wool are the reason why it is used in rehabilitation of various ailments such as: acute rheumatic disorder Merino wool blanket is warm and fluffy and at the same time very light. Merino sheep are originally from Australia and New Zealand, they are responsible for the raw material production of merino wool bedding products which are popularly known for their fluffiness and resistance. Merino sheep are adapted to live in extreme environments, they developed a special condition to survive different levels of temperature and with unique features which are extremely useful for wool bedding quality products. 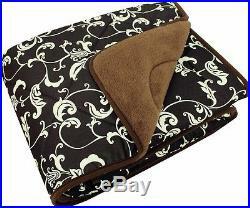 Merino wool blanket is extremely soft, delicate, warm and elegant. Merino wool blanket keeps a constant body temperature and also anti allergic and helps the circulation, eliminates symptoms of cold feet and hands, to speed up the process transfer heat which has a positive impact on changes in the muscles. Sleeping under Merino blanket wool do not allow for sweating and overheating of the body where the discomfort sometimes experienced under the traditional duvets. Merino wool breathes perfectly transmits air skin, body giving better air circulation what means a quiet night's sleep. Merino wool Blanket keep a constant body temperature and also anti allergic and helps the circulation, eliminates symptoms of cold feet and hands, to speed up the process transfer heat which has a positive impact on changes in the muscles. Merino wool blanket has anti-allergic properties because of the high lanolin content covering all her hair addition wool protects the hair from getting dirty. Negative ions neutralize positive ions restoring the body to balance the so-called homeostasis, which is often disturbed by external factors. The item "MERINO WOOL DUVET PILLOW SET CAMEL CASHMERE BLANKET LAMBSWOOL COTTON THROW COVER" is in sale since Sunday, February 12, 2017. 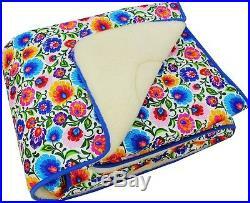 This item is in the category "Home, Furniture & DIY\Bedding\Duvets".poland" and is located in Bialystok. This item can be shipped worldwide.